Yes from 1 year + with pediatric pads and in accordance with the following guide. The AED when analysing infants or children will automatically calculate and adjust the shock voltage to suit the patients’ weight and chest wall thickness. 1 – 8 Years - Yes with paediatric pads for patients up to 25Kgs. If paediatric pads are not available then adult pads may be used. Can I accidentally hurt the victim with an AED? No, not if you use the unit according to its commands. Most Sudden Cardiac Arrest victims will die if they are not treated immediately. Unfortunately paramedics can’t be everywhere in "golden" 3 minutes so your actions can only help. AEDs are designed in such a way that they will analysis and only shock victims who need to be shocked. It’s highly unlikely if you use it properly. The electric shock is programmed to go from one pad to the other (biphasic) through the victim's chest. Basic precautions, such as not touching the victim during the shock, ensure the safety of rescuers and bystanders. The AED instructs when it’s safe or not safe to touch the patient. How do you operate an AED? After exposing the victims bare chest, the rescuer connects the pads to the patient and the Automatic External Defibrillator (AED).The patient's heart rhythm is then automatically analysed by a computer inside the AED and determines if a shockable heart rhythm is present and a shock is required to save the victim. If a shock is required, the AED uses voice instructions to guide the user through saving the person's life or CPR if required. AEDs Australia offers an online training course for the Mindray BeneHeart D1 and the ZOLL AED Plus - courses are included in the Mindray BeneHeart D1 package or can organised by separate arrangement. Please contact use to discuss your training requirements. 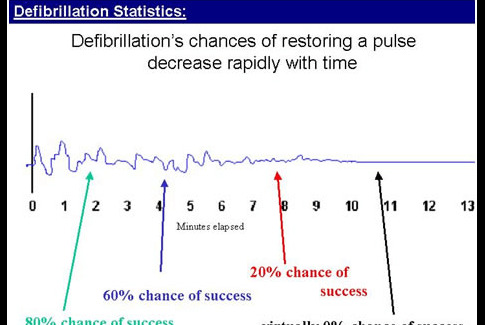 How much time do I have to successfully defibrillate a victim? Victims need to be defibrillated within the first 3-5 minutes to have a real chance of survival from Sudden Cardiac Arrest (SCA). While CPR is very important in the life support process by providing oxygen enriched blood to brain and vital organs, this will only by time until a AED or defibrillator arrives at the scene. We already have an AED! Our cabinet series are suitable for most brands of defibrillators - use your existing AED or consider an upgrade to the new market leading Mindray BeneHeart D1 or a monitored cabinet with integrated fully automated emergency response notification system. An Automatic External Defibrillator (AED) is a small, portable easy to operate lifesaving medical device designed to deliver an electrical shock to a person who is having a Sudden Cardiac Arrest (SCA). They are designed to be used by a first responder who is usually a non-medical layperson to save the life of an unconscious victim. An AED will ONLY allow a shock to be delivered to a victim in cardiac arrest who is in ventricular fibrillation (VF) or ventricular tachycardia (VT) so you cannot administer a shock inappropriately. They are known as public access defibrillators and designed to be used by anyone regardless of training. udden Cardiac Arrest (SCA) is an abrupt loss of pulse and consciousness caused by an unexpected failure in the heart's ability to effectively pump blood to the brain and around the body. It is usually caused by life-threatening arrhythmias, abnormalities in the heart's electrical system. The sudden cardiac arrest victim collapses, losing their pulse, consciousness, and the ability to breathe normally. All of this happens quickly and without treatment the victim will be dead within a few minutes. What is the difference between a heart attack and a Sudden Cardiac Arrest (SCA)? Basically a heart attack is a plumbing problem and a Sudden Cardiac Arrest (SCA) is an electrical problem. The heart has many vessels and can operate when some are blocked but a Sudden Cardiac Arrest is like a complete electrical blackout. What is the most common treatment for Sudden Cardiac Arrest (SCA)? In a word, Defibrillation. Presently this is the only proven method to restore an erratic heart to a normal rhythm for victims of the most common cardiac arrest conditions, Ventricular Fibrillation and Ventricular Tachycardia. Again, while CPR is very important to buy you some time, when a heart is in fibrillation, the only treatment is "defibrillation". Where Would You Place AED’s? In a perfect world everyone should have CPR and AED training, however modern AEDs are designed to be used by any motivated bystander, regardless of training. The devices advise the user about how to apply the device and whether or not to administer a shock. Most of the time, the AED will advise the user with voice prompts to administer CPR, depending on the needs of the victim, however all AED’s have step by step instructions including, voic, text and now video coaching. From the time that the event occurs to the time that medical help arrives is critical. The instructions from the AED are keeping you productive and giving the patient the very best chance of survival until help, which is on the way, has arrived. This is the critical time when defibrillation is needed for the patient to survive. The only definitive treatment for victims of Sudden Cardiac Arrest (SCA) is defibrillation. Sudden Cardiac Arrest (SCA) usually happens without warning and the majority of people have no previously recognised symptoms of heart disease. For the best chance of survival from Sudden Cardiac Arrest (SCA) caused by Ventricular Fibrillation (VF), Automatic External Defibrillators (AED) should be used within the first 3-5 minutes after collapse. Currently worldwide less than 5% of victims survive largely because a Defibrillator does not arrive in time. An AED can increase the survival rate to 50% and in some situations like commercial airlines around 70%.